In a compelling contest between the experienced Scottish and the Irish muscle and bustle, it was the homeside's sheer will to win after a truly miserable performance against England which decided the outcome of this epic encounter. The new look Ireland depended on 22 year old fly-half Ronan O' Gara's boot to hammer home their advantage, but it was not the munster debutant, or any of the other four caps, who took the plaudits but some more familiar faces. Captain Keith Wood was inspirational, leading the charge time and again as Ireland's tight-knit driving play kept Scotland on the back foot throughout. Ably assisted by no.8 Anthony Foley and lock Mick Galwey, and supplied with line out ball by the fearless Malcolm O' Kelly, Wood's drive formed the basis for a win which has salvaged Irish pride. Not that the homeside had it all their own way. They seemed determined to give Scotland enough possession to win a game which their forwards struggled to get into. And whenever the Scots did get the ball, they were engulfed, swamped and dis-possessed. It was heavy stuff. The afternoon started promisinlgly fo the Scots. After his terrible kicking performance in Rome, Kenny Logan was back on target with a penalty after three minutes following Graham Sheil's run into the Irish 22. That break through was followed 15 minutes later by a Logan try after Glenn Metcalfe had set up a ruck in front of the Irish posts and Gregor Townsend threw a long miss-pass to Kenny Logan on the wing. Once again, Logan touchline-kicked spot on for a ten-nil lead. That, however, was to be the high point of an afternoon that leaves the Scots staring at a wooden spoon season in the face less than a year after being crowned Five Nations Champions. The Irish comebacks started almost immediately with new fly-half O' Gara starting a move that lead to lock O' Kelly diving over in the corner after good work from Dennis Hickie and Keiron Dawson. 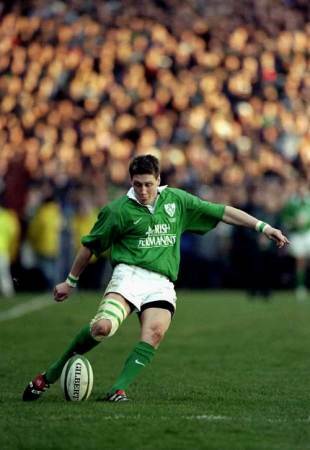 O' Gara's touchline conversion made it 10-7 and ten minutes later, a penalty from from O' Gara drew Ireland level. Another penalty following a Keith Wood drive gave O' Gara a penalty that made it 13-10 on the stroke of halftime. Ireland extended their advantage after halftime with tries from Wasp's centre Rob Henderson, the hugely impressive Brian O' Driscoll, David Humphreys and Keith Wood, the last of which brought the biggest cheer of the afternoon as well as a 44-10 lead. Late scores by Metcalfe and Graham did little to sooth aching Scot limbs, and after losing to habitual wooden-spoonists Ireland - a side they haven't lost to in 12 years and one which contained five new caps - Scotland's seasion of woe looks set to continue.